Volunteer to Sing! If you or your group would be willing to sing a song or two at the banquet, please indicate your interest below. Yes, we'd (I'd) like to sing at the banquet! This year's event again will be held at the University of Indianapolis. Dinner will be held in the Schwitzer Student Center. 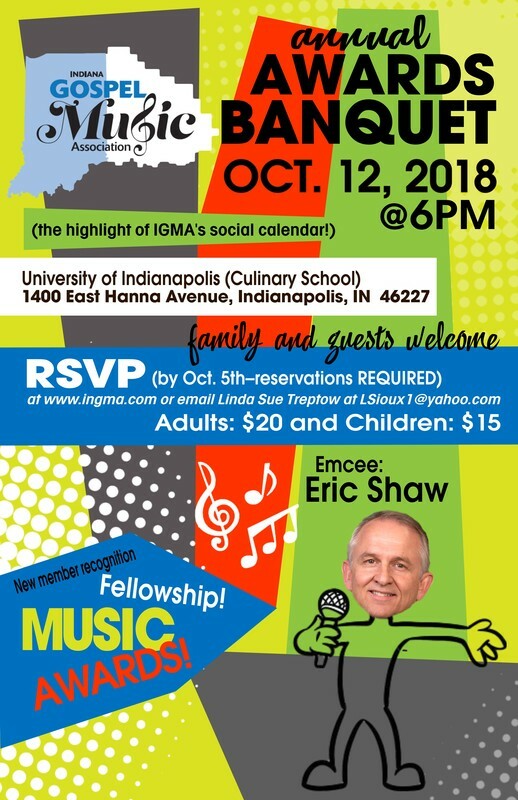 This is the highlight of IGMA's social calendar and a special time of fellowship and fun; you'll not want to miss it! Step-by-step instructions for purchasing tickets. Choose your ticket type (Adults $20 or Children 13 and under $15) from the drop-down menu above the "Add to Cart" button. Once you have chosen the ticket type, click "Add to Cart." A PayPal Shopping Cart will open for you and the ticket item added. Once the ticket item has been added to your cart, choose the quantity to purchase. If you need to add a second ticket type, return to this page, select the other ticket type, and click "Add to Cart" again. The second ticket type will be added to your cart, where you can again choose the quantity. RSVP - Purchase Tickets HERE!